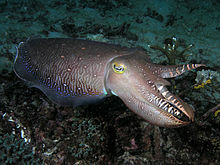 Subclass Coleoidea, or Dibranchiata, is the grouping of cephalopods containing all the various taxa popularly thought of as "soft-bodied" or "shell-less," i.e., octopus, squid and cuttlefish. Unlike its extant sister group Nautiloidea, whose members have a rigid outer shell for protection, the coleoids have at most an internal cuttlebone, gladius, or shell that is used for buoyancy or support. Some species have lost their cuttlebone altogether, while in some it has been replaced by a chitinous support structure. The major divisions of Coleoidea are based upon the number of arms or tentacles and their structure. The extinct and most primitive form, the Belemnoidea, presumably had ten equally sized arms, in five pairs numbered dorsal to ventral as I, II, III, IV and V. More modern species either modified or lost a pair of arms. The superorder Decapodiformes has arm pair IV modified into long tentacles with suckers generally only on the club-shaped distal end. Superorder Octopodiformes has modifications to arm pair II; it is significantly reduced and used only as a sensory filament in the Vampyromorphida, while Octopoda species have totally lost that arm pair. By the Carboniferous, coleoids already had a diversity of forms, but the major radiation happened during the Tertiary. Although most of these groups are traditionally classified as belemnoids, the variation among them suggests that some are not closely related to belemnites. ^ Based on a perceived sudden appearance in the fossil record and great complexity a speculative theory that coleoidea arrived as cryopreserved eggs from space has been advanced. This means they came from a place where evolution was more advanced in terms of complexity. If coleoidea did not arrive as eggs from space it is also possible that the clade evolved by horizontal gene transfer with the genes arriving from space. This view is however rejected among others by Karin Mölling. ^ Marion Nixon; J.Z. Young. (2003). The brains and lives of cephalopods. New York: Oxford University Press. ISBN 978-0-19-852761-9. ^ Bandel, Klaus; Reitner, J. & Sturmer, W. (1983). "Coleoids from the Lower Devonian Black Slate ("Hunsruck-Schiefer")". Neues Jahrbuch für Geologie und Paläontologie, Abhandlungen. 165 (3): 397–417. ^ Nishiguchi, Michelle & Mapes, Royal K. (2008). "Cephalopoda". In Ponder, Winston F. & Lindberg, David R. (eds.). Phylogeny and evolution of the Mollusca. Marine Ecology. 30. Dordrecht, The Netherlands: Springer. pp. 163–199. Bibcode:2009MarEc..30..269Z. doi:10.1111/j.1439-0485.2009.00287.x. ISBN 978-0-520-25092-5. ^ Turek V; Manda Š (2012). "An endocochleate experiment" in the Silurian straight-shelled cephalopod Sphooceras". Bulletin of Geosciences. 87 (4): 767–813. doi:10.3140/bull.geosci.1335. ^ Smith, M. R.; Caron, J. B. (2010). "Primitive soft-bodied cephalopods from the Cambrian". Nature. 465 (7297): 469–472. Bibcode:2010Natur.465..469S. doi:10.1038/nature09068. hdl:1807/32368. PMID 20505727. Archived from the original on 2016-01-27. ^ Smith, M. R. (2013). "Nectocaridid ecology, diversity and affinity: early origin of a cephalopod-like body plan". Paleobiology. 39 (2): 291–321. doi:10.1666/12029. ^ a b Steele, Edward J.; Al-Mufti, Shirwan; Augustyn, Kenneth A.; Chandrajith, Rohana (2018). "Cause of Cambrian Explosion - Terrestrial or Cosmic?". Progress in Biophysics and Molecular Biology. 136: 3–23. doi:10.1016/j.pbiomolbio.2018.03.004. PMID 29544820. ^ Moelling, Karin (2018). "Commentary to: Cause of Cambrian explosion - Terrestrial or cosmic? Steele, E.J. et al". Progress in Biophysics and Molecular Biology. 136: 24. doi:10.1016/j.pbiomolbio.2018.03.005. PMID 29571770. ^ Doguzhaeva, Larisa A.; Mapes, Royal H.; Mutvei, Harry (2007). "A Late Carboniferous Coleoid Cephalopod from the Mazon Creek Lagerstätte (USA) with a radula, arm hooks, mantle tissues, and ink". In Landman, Neil H.; Davis, Richard Arnold; Mapes, Royal H. (eds.). Cephalopods Present & Past: New Insights and Fresh Perspectives. Berkeley & Los Angeles, California, USA: University of California Press. pp. 121–143. ^ Garassino, A.; Donovan, D. T. (2000). "A New Family of Coleoids from the Lower Jurassic of Osteno, Northern Italy". Palaeontology. 43 (6): 1019. doi:10.1111/1475-4983.00160. Bather, F.A. (1888). "Shell-growth in Cephalopoda (Siphonopoda)". Annals and Magazine of Natural History. 6 (1): 298–310. doi:10.1080/00222938809460727. "Octopuses Do Something Really Strange to Their Genes"